Desk Report: Young Founders School (YFS) successfully launched the first weekend Bootcamp in Dhaka, Bangladesh. Young Founders School is a technology-focused non-profit educational organization which aims to change the way entrepreneurial education is taught to secondary school students. YFS is the world’s first global entrepreneurship program for high school students, says a press release. “As Pathao is a young startup itself, we’ve faced entrepreneurial challenges first hand and are pretty familiar with what the struggles can be like. At Pathao we promote ownership among our employees, inspiring the entrepreneur in them as well. And so, partnering up with an organization that is working tirelessly to empower young entrepreneurs is an absolute pleasure.” said Hussain M Elius, CEO, Pathao Limited. YFS was founded in Hong Kong in 2016 by Billy Naveed. Billy himself began as a ‘young founder’, having established two startups before age 16. This program is sponsored by international investment bank Credit Suisse, Alibaba Entrepreneur Fund and locally by Pathao and Osiris Group. 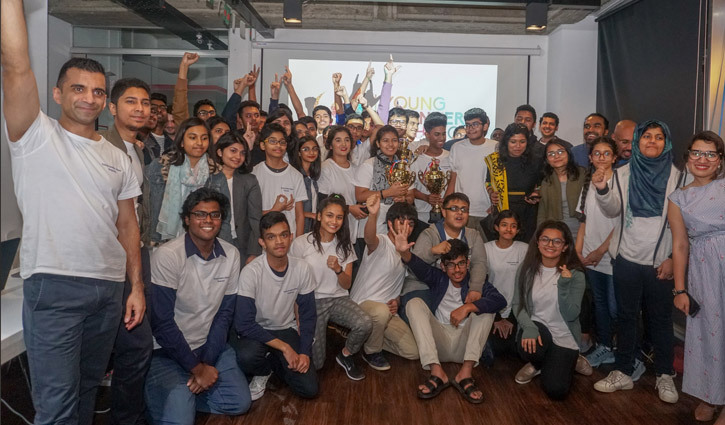 After successfully launching in major cities across Asia such as Hong Kong, Singapore and Shenzhen YFS recognized Dhaka for its entrepreneurial spirit and been chosen as the next location. At the Bootcamp, the students learned from mentors from the tech industry, the latest startup techniques such as lean startup, product market fit and competition analysis. They also had an opportunity to develop their startup ideas into fully-formed business pitches, and present to a panel of three Venture Capitalist judges for funding. The judges were Samad Miraly, Co Founder, Startup Dhaka, Masud Ul Haque, Associate, IDLC Asset Management Limited and Nirjhor Rahman, CEO, Bangladesh Angels. Business ideas from the winning teams at YFS’ previous Bootcamps include an Internet of Things (“IOT“) enabled device for walking aids to prevent falls for the elderly or those with disabilities and inform their loved ones in real time, an app that helps people facing mental health issues by suggesting mood-improving tasks, and an online platform for high school internships. After the launch in Dhaka YFS intends to reach out other cities such as Chittagong and translate the course to make it available in Bengali as well. In the past 24 months since its inception, YFS has run nine startup Bootcamps and seven Ideation Days in Hong Kong, Shenzhen and Singapore involving more than 1300 students, 57% of whom were female students, and more than 300 mentors from companies such as Alibaba Group, Google, 9GAG, Microsoft, Techstars, PricewaterhouseCoopers, GoGoVan and many more. The Bangladeshi mentors' list consisted of industry experts coming from backgrounds such as Pathao, BRAC Social Innovation Lab, Commonwealth Bank of Australia, Plaantik, Selise rockin’ software, and a few renowned startups.